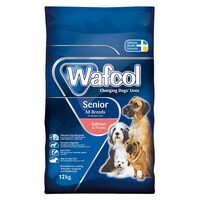 Wafcol Senior Dog Dry Dog Food for All Breeds (Salmon & Potato) is a highly palatable balanced food for senior dogs. Wafcol Senior dog food contains lower protein content than other Wafcol adult dog foods, balanced with optimum levels of vitamins, minerals and essential nutrients. The nutritional profile includes optimum levels of calcium and phosphorous for strong bones and teeth, Omega 3 & 6 fatty acids and iodine rich seaweed for many functions and glucosamine, chondroitin, sulphate and methylsulfonylmethane (MSM) to help support and maintain healthy joints. Formulated with no cereals such as wheat gluten, wheat, maize, barley, rye and oats and it also excludes red meat, poultry, whitefish, dairy products, soya, artificial colours, preservatives and flavours, all of which may trigger food intolerances and food allergies. My 16 year old springer spaniel stopped scratching after a week on this food saving us a fortune in vets bills and meant we could stop the steroids that caused him so many problems. Great!